Pictured clockwise, Margaret Ward, Maria Beadle and Michael Bird were chosen as Country Terrace’s 2018 Lifetime Achievement Award recipients. When it came time to select a recipient for Country Terrace’s 2018 Lifetime Achievement Award, team members at the Komoka, Ont. long-term care home couldn’t decide on one. 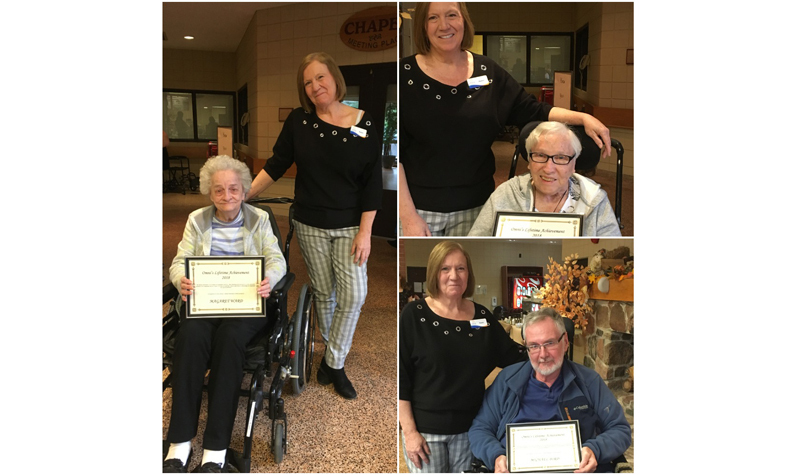 Team members this year awarded Maria Beadle, Margaret Ward and Michael Bird with the accolade, which is presented to people living in OMNI Health Care long-term care homes who have demonstrated commitment to other residents, their home and country. Maria worked as an RN for 40 years. She worked in the outreach program at Parkwood Hospital in London, Ont., where she was a member of the palliative care planning committee. In fact, some of the practices Maria and other committee members helped create are still being used in long-term care homes today, including Country Terrace. “Maria actively participates in programs throughout the home and likes to help others whenever she can,” Country Terrace team members write in their nomination. Before moving into Country Terrace, Margaret was a dedicated hospital volunteer for many years. She also volunteered her time with Meals on Wheels and is a recipient of the prestigious Governor General’s Caring Canadian Award. At Country Terrace, Margaret has become a champion at resident engagement, say staff members. She is one of the co-presidents of the home’s residents’ council, and she works hard to ensure her fellow residents are having the best experience possible in their home. “Margaret encourages other residents during programs and socializes with residents and staff when not involved in activities,” say Country Terrace staff members. For Michael, helping others has been central to his life, and it’s a passion he continues at Country Terrace. Michael worked for the Ministry of Environment for more than 30 years. Michael continues to be active in his chapter of the Kiwanis Club, and he even helped create a partnership between Country Terrace and the Kiwanis Club to marry the club’s services with residents’ needs. “Michael is a very interactive and social man who has a long history of dedicating himself to the service of others,” the Country Terrace team says.